If you’re trying to lose weight or maintain a healthy diet, choosing the right snack late at night can be challenging. It’s so easy to grab a chocolate bar or scoop of ice cream before bed, after all. An equally easy but healthy alternative is yogurt. This late-night snack is a nutritious food that you don’t have to feel bad about. It’s late and you’re tired. You want a snack before bed, and you're desperately craving something sweet. According to an interview with the Washington Post, Kelly Allison of the University of Pennsylvania School of Medicine’s Center for Weight and Eating Disorders says that this is actually normal; people often want sweet and salty foods at the end of the day. Often, this is because they’re tired or have restrained themselves from eating unhealthy things all day long. However, you should be conscious of eating unhealthy snacks late at night. These calories are more likely to be stored as fat and can consequently contribute to weight gain. Scientific research has long known the relationship between nutrition, metabolism and the hours we keep. Studies published in 2015 and 2017, respectively, in the International Journal of Obesity and in the journal Circulation showed that eating patterns can not only affect your weight but your blood pressure, blood sugar and cardiac health. While you should avoid eating late-night snacks when possible, snacking isn't always a bad thing. According to the MIT Medical Community Wellness Center, small portions of low-fat, protein-rich snacks are okay to eat late at night. In fact, eating small portions of about 150 calories can even improve muscle synthesis and cardiometabolic health. Eating yogurt before bed is a good choice if you’re in need of a late night snack. Foods with high protein content, like nuts and yogurt, can help keep you feeling full and will reduce your desire for that candy bar or slice of pizza. 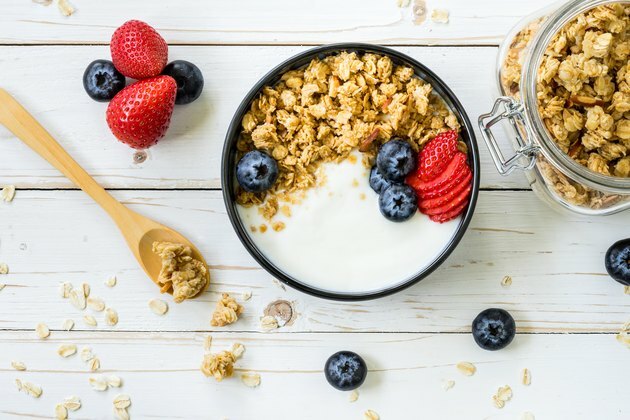 Yogurt also has the added benefit of being rich in calcium, which is not just good for your bones, but also able to improve your quality of sleep. It’s important to remember that not all yogurt is created equal. Certain yogurts, like flavored yogurts with added sugars, are not great options to eat before bed. Instead, opt for plain, healthy yogurts like Greek yogurt. A standard 150 gram serving of Greek yogurt has 130 calories. When eating yogurt at night, you don’t have to eat it plain. Just buy plain yogurt and add whatever you want while staying away from additives and extra sugars. For a sweet yogurt, add fruits like raspberries or strawberries. For a salty one, try shredded cucumbers and lemon to mimic a flavor similar to tzatziki or raita. If you’re on a low-carbohydrate diet, you can even add toasted nuts to your yogurt.